On November 13th, LinkedIn relaunched Company Pages as LinkedIn Pages, adding new features that customers value most. If you log into LinkedIn today, you’ll notice some obvious differences. 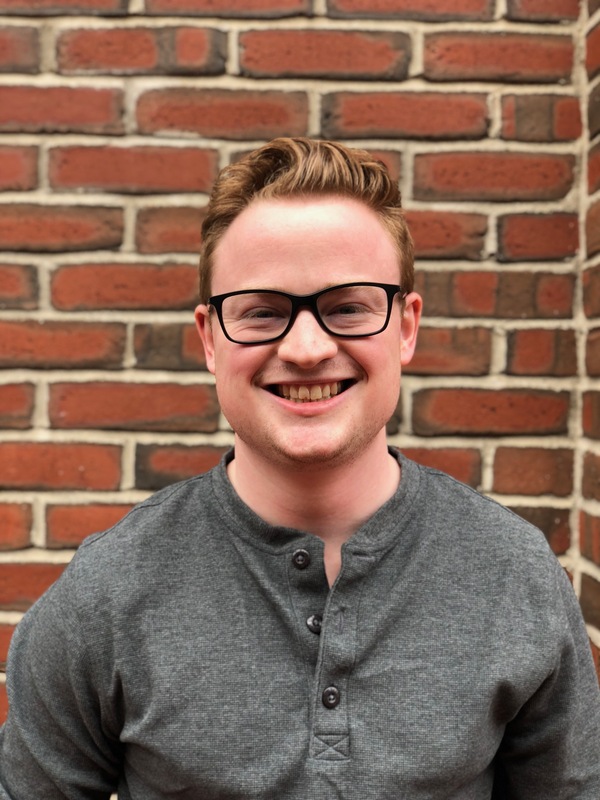 The UI is cleaner and easier to navigate -- additionally, look a little deeper and you'll see there are a number of new features geared towards helping you leverage LinkedIn to grow your business. Whatever you specialize in, you want your company to be part of the conversation. But conversations on LinkedIn don’t just happen during your nine-to-five work day. What if you want to make a post during your commute to work, or respond to a comment on your video as soon as it comes in? With mobile admin, you can now manage conversations important to your company while at your desk, or on your phone while you’re on the go. More than half of LinkedIn’s traffic comes from their mobile app, but a number of the benefits that individual users enjoy in the mobile app have not been extended to LinkedIn Page admins. 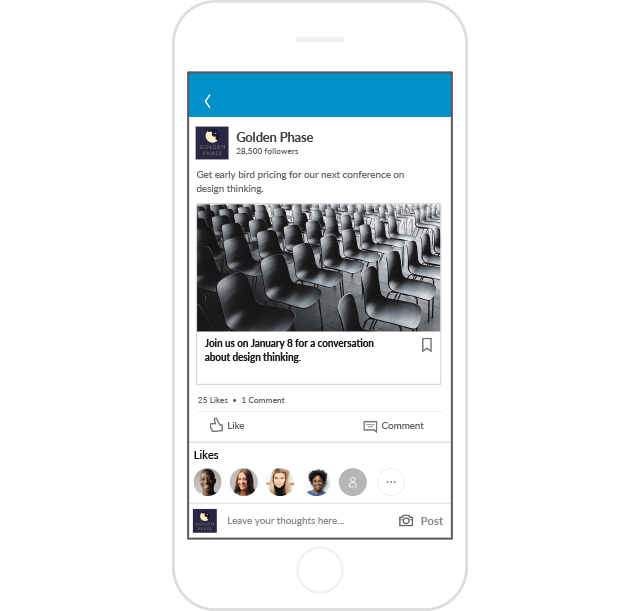 LinkedIn’s mobile app now lets you post, update, and respond to comments from anywhere --- making it easier to manage the conversations in which your company is taking part. LinkedIn Pages also now enable you to participate in conversations important to your success. For example, you can now associate up to three hashtags to your LinkedIn Page. This lets individuals dive into topics that you’ve associated with your company. With this update, you can now associate your brand with various trending topics, and more easily take part in that conversation. Another update to LinkedIn Pages includes the ability to share different media types natively within LinkedIn. 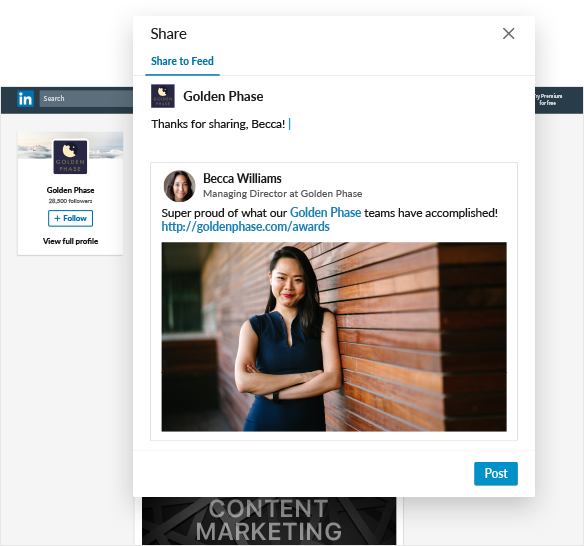 You can now upload PDFs or docs directly into a LinkedIn Page post, giving you a great opportunity to share brand stories that can be used to promote your overall brand. For example, here at HubSpot, we could share our Customer Code directly on our LinkedIn Page. Going further than just PDFs and docs, video on LinkedIn allows you to share quick, authentic video messages with your followers. Video is growing quickly on LinkedIn, with 17% more marketers posting video on the platform in 2018 than the year before. LinkedIn’s native video solution gives marketers even more reason to lean into video. These videos will auto-play in the LinkedIn newsfeed, and will stay there longer than just a video linked from another platform, like YouTube. Consider using video to tell a quick customer success story, or to authentically promote one of your products or services. Your success is tied to your ability to understand your audience. The more keyed into the unique challenges and needs of your audience, the stronger your content will be, and the more it will resonate with your audience. 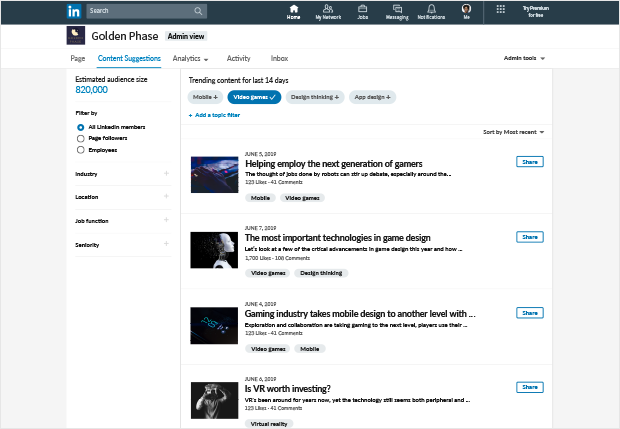 To help you understand exactly what content is resonating with your audience, LinkedIn Pages now offers "Content Suggestions." With Content Suggestions, simply select your audience, and you’ll be presented with a list of topics and articles they are interested in. Create original content based around these topics, or share articles your audience is already interested. This update makes it easier than ever to stay active on LinkedIn -- driving traffic to your page and increasing your follower count. Once you start creating and sharing content that interests your audience, you need to determine whether or not your content strategy is successful. LinkedIn Pages now give administrators stronger visual analytics that can be used to further understand your success on their platform. You can filter your dashboard by any time frame to determine how you are performing over time, and adjust your strategy accordingly. All admins will receive a monthly summary email, providing them with the demographics of people visiting the site and which content they are interacting with. LinkedIn is often thought of as a platform where individuals can find their next job, and companies can attract new talent. Not enough attention is given to how you can leverage your current employees to grow your brand. Employees generally have ten times the reach of a company on LinkedIn, making them a great resource for expanding your brand’s reach. With the updates to LinkedIn Pages, admins will now receive a notification every time their company is tagged in a post. These posts can easily be shared to your LinkedIn Page, making it easy to fill your page with content, expand your reach, and humanize your brand.